Murder mystery have an air of excitement always around them. There's a lot of anticipation about what's going to happen next and it ruffles up many in the process. 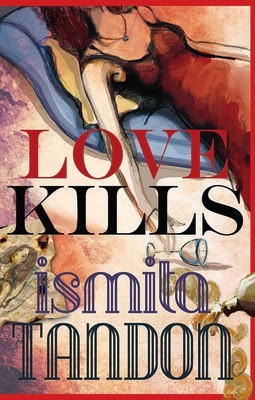 Author Ismita Tandon in her latest thriller book "Love Kills" takes a lesser known route which needs precision and deliverance at it's best. So has she been able to do both with a single shot? Let's find out. Meet Johnny W - Will, not Walker - named thus by his alcoholic father who died under mysterious circumstances. Johnny is the founder of Thy Will, a dead diction centre for the rich and the famous and the fiancée of Mira Kermani, daughter of the richest man in town. His questionable methods aside, Johnny's commitment to ridding his patients of alcohol and drug abuse is beyond doubt. How ironic then that Mira is found dead in her apartment from an overdose of morphine. But why is Officer Ray convinced that Johnny is the killer? Johnny's assistant Sera, who secretly love him and his half-brother Zac are working hard to protect him from the officer. Or are they? Could Aunt Adele's hunger for what was rightfully her sons inheritance have driven her to murder? Or is the murderer an unhappy patient? From the author of the disturbing and controversial Jacob Hills, an unputdownable story of crime and passion in the hill station town of Monele. First look at the title and the cover and no guess work is required to decipher the theme of the story. The title itself is suggestive and the cover image adds up to the whole set up. The cover image could have been done a bit more tastefully as it look little plain. The blurb talks about a small town and a gruesome incident which has taken place. The author manages to conceal the hidden secrets of the story and rise up the temptation to go through the entire book. The story is set in Monele a small hill station near Ooty where Johnny Will a renowned doctor is embroiled in a controversy in the past and present both. Both the murders marking him as a prime suspect. The small peaceful town disturbed by the height of atrocities in it's womb. Officer Ray appears from Johnny's past and is hell bent on proving Johnny guilty. But it's not going to be an easy task. So is Johnny really guilty? Will officer Ray be able to decipher the mystery behind the entire sequence? How many lives will be at task during the entire process and who will turn out to be a friend or enemy is to be found out? That's what the story is all about. The small town set up, few but powerful characters, a confined storyline, murders,suspects, varied interests and a lot of confusing theories make up the entire face of the story. All of them mixed and fine tuned to perfection. The vocabulary of the author and narration making up the entire core of the book. The story promises all thrill and excitement and suspense which one tries to search and rely on in a mystery book. The excitement and a feeling of something about to happen all the time adds up to the already pent up emotions. The book making merry of the readers brains and the teasing effect of the entire story a feather in the cap. The intensity is no less every time a page is turned or a chapter is dealt with. It has been written with conviction and command. There no downsides in the book. All in all the story ties and binds you from the first till the last page. All glory and no duller effects make it one of a better known stories. The plot spreading it's charisma with all in abundance of what is required in a story. Not a foot wrong during the carving out of characters and plot. The book with deliverance in style and magnanimous effect. A colourful yet deep dark thriller for the readers to cherish and savour for a long time.